In 2015, world leaders adopted 17 Sustainable Development Goals (SDGs) targeted at improving the world and leaving no one behind. SDG 3 aims to “ensure healthy lives and promote well-being for all at all ages. SDG 3 also has 11 targets, the third of which focuses on ending the epidemics of AIDS, tuberculosis, malaria, Neglected Tropical Diseases (NTDs), hepatitis, water-borne diseases and other communicable diseases by 2030. The health landscape in Africa, however, poses many challenges to the attainment of these goals. 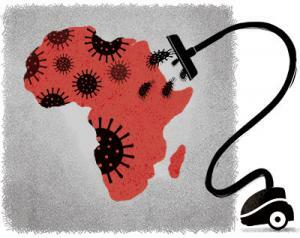 While there is progress in combating some diseases, other diseases have been neglected and require significant inputs. NTDs are a group of bacterial, parasitic and viral diseases that result in disabling and disfiguring conditions. They are strongly associated with poverty in tropical and subtropical environments, especially among the rural poor and disadvantaged urban populations. NTDs affect child development, pregnancy, and productivity. About 1.5 billion people are infected with NTDs worldwide, with Africa accounting for nearly 40 per cent. With an estimated 51 per cent of the population in sub-Saharan Africa (SSA) living on less than US $1.25 per day, SSA represents the world’s largest concentration of poverty and NTDs. Estimates also suggest that more than 500 million people in SSA are affected by four of the most common NTDs, including lymphatic filariasis (LF), onchocerciasis, soil-transmitted helminth (STH) infections and schistosomiasis. Countries with large populations such as the Democratic Republic of Congo, Ethiopia and Nigeria have the highest burden of some NTDs in Africa. The woes of the continent are further worsened by conducive environmental factors such as temperature and humidity that lead to the development of disease pathogens and vectors that transmit them, coupled with poverty, unsafe water, poor sanitation and inadequate housing which perpetuate the transmission cycle. Together with the geographical and economic challenges, several other factors contribute to the neglect of NTDs in Africa. First is the presence of competing public health interventions. Fast killing diseases such as malaria, HIV/AIDS, tuberculosis, and more recently Ebola and other viral hemorrhagic fevers, receive more attention and funding compared to the slow acting, long-term and chronic NTDs. In 2016, for example, the US provided $100 million towards NTDs compared to $1.5 billion for HIV, malaria and tuberculosis. The contribution of African countries towards health interventions is also minimal. Following the Abuja Declaration of 2001, African countries pledged to increase their health budget by least 15 per cent of the country’s annual budget, and requested Western donor countries to increase their support. At present, only five countries—Botswana, Madagascar, Rwanda, Togo and Zambia—are known to have met the target. Promoting health through increasing health expenditure is vital to reduce poverty and associated diseases. With disease control programmes in African countries relying heavily on donor support, the failure of governments to commit financial resources towards such activities have limited the progress that could have been achieved. Moreover, political instability and conflicts in some African countries contribute to delays in achieving disease control, even when financial resources are available. Finally, there is the challenge of community fatigue, resulting from years of disease control interventions against diseases such as LF and onchocerciasis. The absence of apparent physical symptoms—elephantiasis and hydrocele in the case of LF and blindness in the case of onchocerciasis, even though the infection is present—gives community members the impression that the disease is no longer present. As such, they refuse treatment for a disease they deem not to have. Despite these challenges, all is not lost. There are global and regional commitments towards controlling NTDs. The London Declaration on NTDs in 2012 saw an increase in pledges from pharmaceutical companies to provide free medicines for as long as needed, and commitments from non-governmental development organisations to assist in the implementation of programmes in endemic countries. In 2013, the World Health Assembly (WHA), through Resolution WHA 66.12, defined strategies for NTDs with clear targets and milestones, and endorsed the WHO NTD Roadmap goals linking NTDs to universal health coverage. In 2015, NTDs were added to the health targets of the SDGs with a goal to reduce the population getting infected by NTDs by 90 per cent by 2030. The launch of the Expanded Special Programme for Elimination of Neglected Tropical Diseases (ESPEN) in 2016 has as a principal goal of eliminating five Preventive Chemotherapy (PC)-NTDs in Africa by leveraging funds and drugs to support coverage and access to treatments, strengthen health systems and provide universal health coverage of interventions against PC-NTDs. At the 30th African Union Summit in January 2018, heads of states added NTDs alongside malaria and maternal and child health as top health priorities for the continent. These different commitments over the years have resulted in some significant achievements towards the elimination of NTDs in Africa. The tools available for NTD elimination are constantly being improved with the changing epidemiology of diseases, as countries move from pre-control to elimination status. The challenges encountered at each stage inform the need for the development of new strategies, drugs and rapid diagnostic tests (RDTs) to meet the elimination targets. There are now paediatric praziquantel formulations for schistosomiasis control currently under evaluation, and the development of RDTs for the diagnosis of Human African Trypanosomiasis being assessed in east Africa. Some countries have also made progress towards the elimination of NTDs. Egypt and Togo have been certified free of LF, and Ghana and Morocco have been certified free of trachoma. Many other countries have made significant reduction in the burden of diseases such as onchocerciasis, LF, trachoma and schistosomiasis. Community health education programmes are being intensified to promote the acceptance of interventions. Integration of programme activities is being done to accelerate elimination, maximise the use of resources and improve cost-effectiveness. The challenges to NTD elimination in Africa are multifaceted. However, the political commitment of governments and the financial support of international and non-governmental organisations is enabling the continent to achieve some progress, albeit not optimal, to control and eliminate NTDs. More inputs will be required in the next 12 years to attain the SDG 3 targets on NTD elimination. What is certain is that by 2030, the burden of most NTDs in Africa will be significantly reduced. (This article was first published in the 1-15th December issue of Down To Earth under the headline 'Shifting the focus'. It is part of a series on healthcare in Africa).